Welcome to Paul Gibbons Landscapes Ltd! 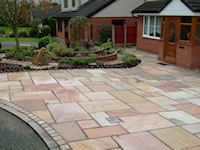 Established in 1988 we are a family run business based in Macclesfield that provides paving and landscaping services throughout Cheshire. For a free no-obligation consultation and quotation so please contact us to arrange a mutually convenient appointment for either weekends or during the week to discuss your landscape requirements.